I was on cloud nine when I got invite to attend McCain Snack Party with Karishma. I read, re-read the invite, checked the date, took printout immediately, my dress, accessories everything was ready. I was super excited to attend the event. Reason was both McCain and Karishma. I love McCain Snacks. I am a huge fan of Karishma Kapoor. I admire her for her fashion sense, movies, grace with which she has carried herself in Bollywood. It was like dream come true. I reached before scheduled time when Karishma and McCain team was busy interacting with media. I watched all the activity from the distance. After half an hour my event started. It began with a small fun question and answer session by Anchor Nitin Arora. He was great and made audience laugh throughtout the event with his wit, humor. 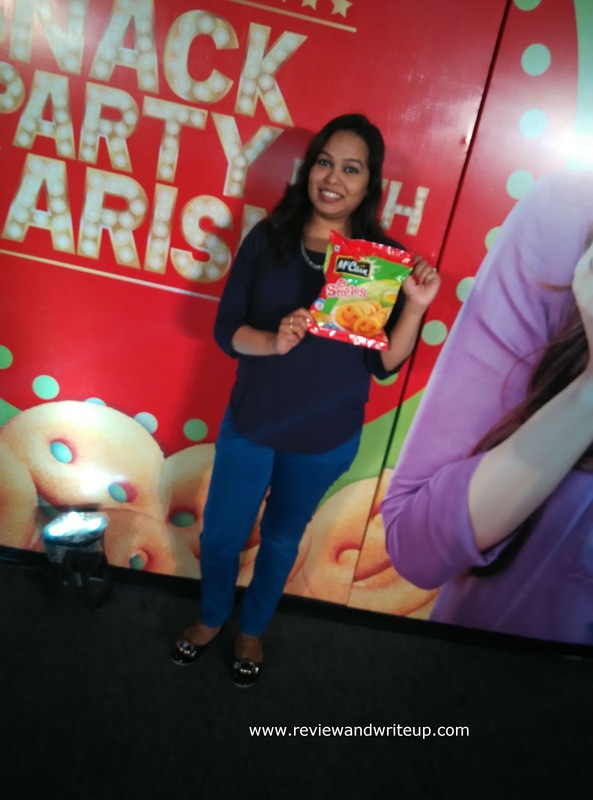 This followed by Introduction of McCain Foods by its marketing GM Gunjan Pandey. She told us about how manufacturing of McCain Foods has been done in India. 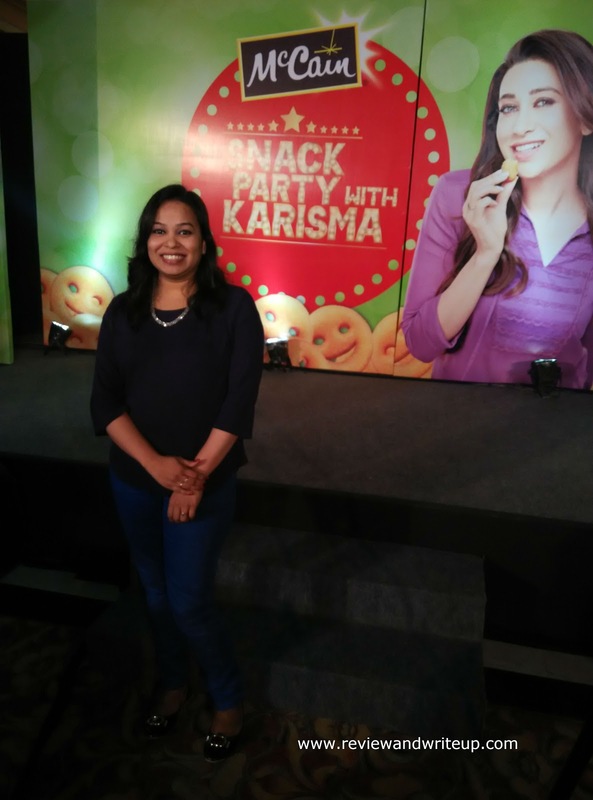 We patiently waited for her speech to end as all were eager to see Karishma ka Karishma on stage. Then finally she entered and audience clapped like anything. It was delightful to see her on stage. She looked lovely in her red skirt and cream white top. Dress was like Indian-western mix. I would say McCain definitely made a great choice in hiring her as their brand ambassador. 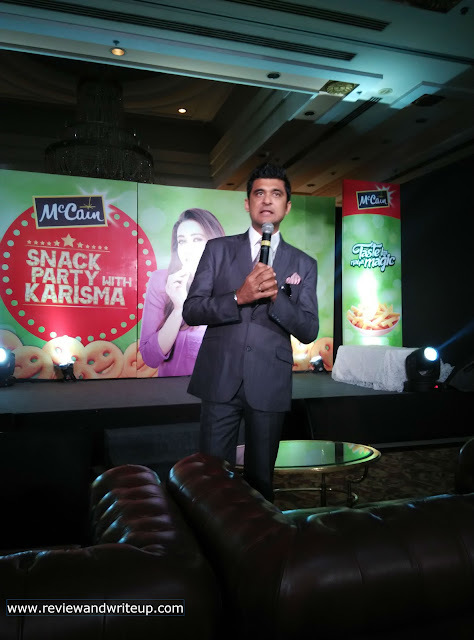 Karishma’s association with McCain has definitely helped the brand in capturing market place in India. 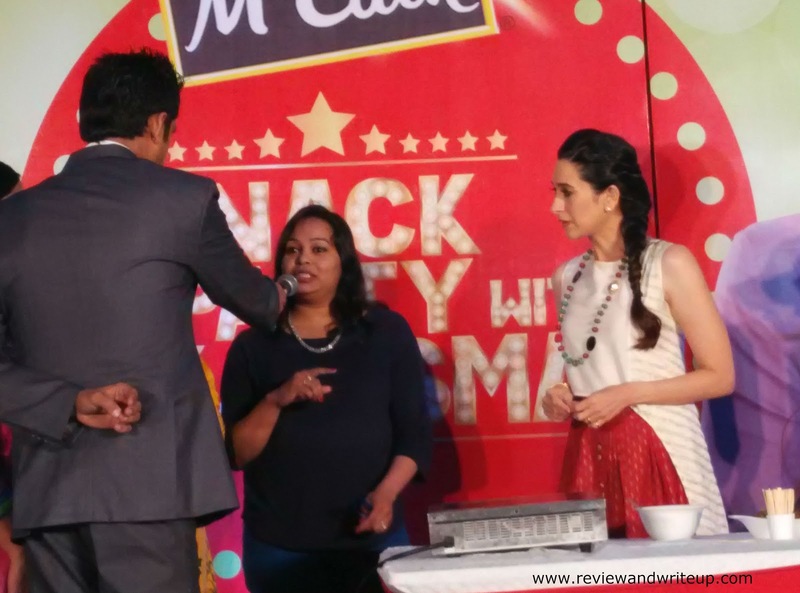 McCain India MD Vikas Mittal and Chef Tushar joined the diva on stage and clicked several photographs. Best is coming guys. Chef experimented McCain snacks with simple yet delicious recipes. They engaged audience as well and I too got chance to go on stage. I don’t have a picture when Karishma was feeding me (although this sweet memory will remain intact in my brain). They invited kids on stage and it was wonderful. Every one present in the audience got chance to click their photo with the celeb. That was really nice of McCain. Whole event was well planned, organized. All appreciation goes to McCain, their organizers, PR’s, Gunjan and team. We came back home with some McCain. Thanks again to the brand. I hope you liked my experience. Nice to be here today on your wonderful page. I am here today via Vashishta Kapoor's round up post wherein you have been mentioned along with some wonderful Indian bloggers.